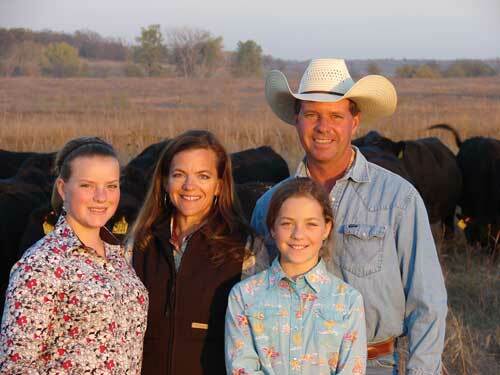 The following is a guest blog post by a cattle rancher friend of mine, Barb Downey. Please join me in promoting and growing the movement #GiveBeef! On the ranch with Barb and Joe and their daughters Anna and Laura Cate. Our cow herd has given us a lot over the years. A good living, a way of life that lets us work together as a family, a way to teach our kids the joys and responsibilities of an intimate bond with animals and a way to live in partnership & harmony with our environment to provide safe, wholesome & nutritious beef. In return, we give our cow herd the best we have to offer; top nutrition, health care and a lifetime of interaction with humans that ensures they are treated properly. So while every job has its ups & downs, when the dust settles, cattle ranching has been a blessing and a gift. This is why all of us in agriculture, both farming & ranching, do what we do. Sure, its long hours spent in some of the worst Mother Nature can dish out, but the blessings are many and manifest. Nearly one-half (47%) volunteer with a youth organization compared with a national average of about 7 percent. About one-third donate their time to community civic organizations beyond youth groups. On average, cattlemen volunteer 11 hours each month to non-profit organizations or charitable causes. Farmers and ranchers are not just generous with their time, but also contribute to charitable causes. About one-half of farmers and ranchers donate at least $500 annually to local or national charities and nearly one-third donate at least $1,000. I want to recognize that and use it to inspire all of us to unite in our giving. I’m calling on you, America’s Ranchers, Farmers & all of you who support ag producers every day to join me during the Holidays, long winter & all year long in putting a face on the generosity of our ag community. According to the U.S. Department of Agriculture, in 2010, 14.5 percent of U.S. households were food insecure at least some time during that year. The beef community is responding to this need in a number of ways, from donating beef to food banks to volunteering time in our local communities. How can I make a difference, you ask? Here at Downey Ranch, we donated a beef and contacted our local locker to donate the processing & packaging. GTB Meats, Inc. of Riley, KS stepped up to the plate and together, we were able to deliver over 460 lbs (1800+ servings!) of ground beef to the Flinthills Breadbasket. In turn, the Breadbasket will distribute that to local individuals & families in need this season. We are fortunate that what we & our cattle produce provides a huge nutritional punch to those members of society most likely to be deficient in what beef provides so well; complete, high quality protein & plenty of vitamins & minerals often lacking in Americans’ diets. So donate beef (or pork, poultry, dairy or other quality foods from American agriculture). If you don’t have actual product, sell a few bushels & buy quality product. If you just love ag & want to help, offer to buy part or all of a beef from a rancher and donate that way. Just find out what your local organizations need & help to secure it. There are pantries, kitchens, churches, schools, etc. in every community needing you to step up to the plate. Then let us know what you’ve done so we can help you inspire others. Together, we can share the bounty of America’s ranches and make a real difference. Wonderful story, will definitely be sharing!